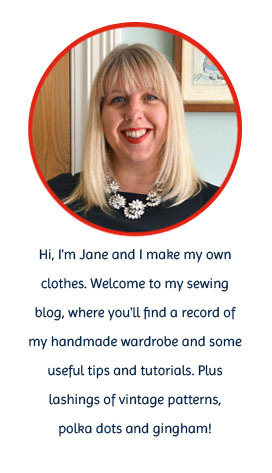 Looks great Jane, loving the different red themed outfits! Looks wonderful. I love all the detailing (and the colour coordinated kitchen!). I'm not scared of a few buttons, but I think I'd find that many a bit daunting! How cute! I love LOVE the polka dot pockets, it's those little details that just make a garment that bit more special. Looks great! This one is now on my 'to sew' list! I have some Midwinter Hawaii, but nothing as impressive (or as cute) as your collection! Ooh, you are clever to have spotted that! I used to have a few teacups on display but everything else was in a box for years, until my lovely husband built me the display shelves recently. I need to make more red spotty clothes now to co-ordinate! Off to look up Midwinter Hawaii! Wow Jane, this skirt is so cute! I particularly love the pockets in the contrasting fabric. I've never made a skirt and I always find shop-bought ones don't fit me very well...maybe I should give it a go soon! It's FAB-U-LOUS! I so love it! Navy and red is such a great combo and it goes with so many things! good job!!! A brilliant version of the skirt. Love the red and white spots and the blouse. It's a really lovely skirt - well done! And I love the contrast pockets. Jane Jane Jane I tried again (and failed again) last night to 'turn' my belt loops using a loop turner but it just doesn't work. My material (not terribly heavy denim) just won't turn! How did you do it - any tips? What am I missing? Help!